My daughter and I would basically eat these every morning – and sometimes, for weeks at a time, we do. It’s mostly only running out of cottage cheese that slows us down. If you have Eastern European relatives, then you will know what I mean when I describe them as a little bit like blintzes, but with the filling and crepe all mixed together: tender, delicate, and so tasty. Please note, too, that the recipe scales down easily: you can even quarter it to make the perfect serving for one person. 1. 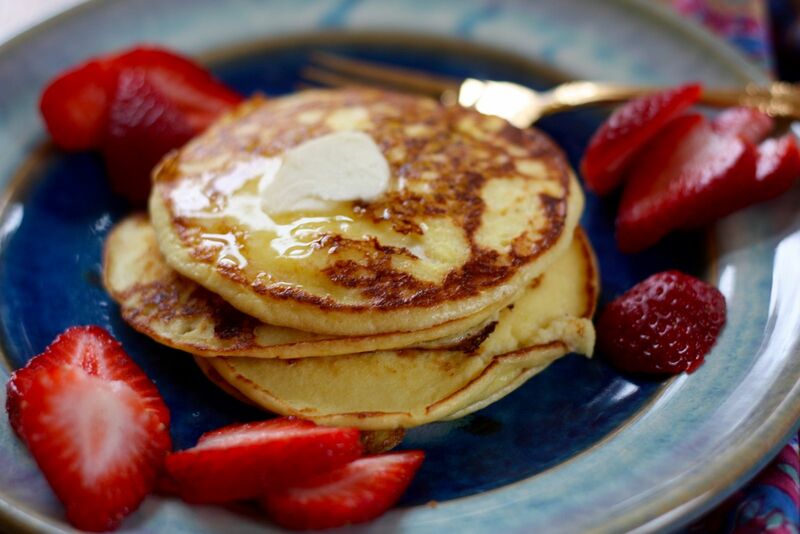 Heat a skillet or griddle over medium-low heat while you prepare the batter. 2. Put all the ingredients in a blender and blend until there are no lumps. 3. Butter the skillet (which should be hot by now), then pour in dollops of batter so that they spread into 3- or 4-inch circles. Cook until the underside is deeply golden and the edges are starting to look dry, then flip and cook until the other side is golden (around 5 minutes altogether). 4. Serve with butter and fruit, or, honestly – and this is my favorite way – completely plain.